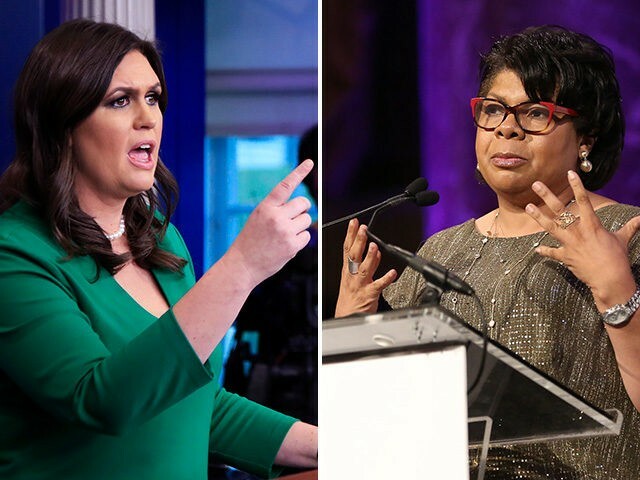 American Urban Radio White House correspondent and CNN analyst April Ryan said that White House press secretary Sarah Sanders should be paying for her bodyguard in an interview with The Hollywood Reporter published Tuesday. April Ryan told THR that she hired a bodyguard after receiving death threats. “All I’m going to say for my safety is: I have a team,” she was quoted as saying. The CNN analyst also thinks that Sarah Sanders should foot the bill for her protection. “I’ve had some people wait for me outside the White House… There is a concern now. I mean, I’ve had death threats, I’ve had craziness, so I have a real concern. An honest, real concern… Do I have a bodyguard? Yes, I do. Am I paying for it? Yes, I am. And, I think [Sanders] should have to pay for it, especially if she’s stirring it up with her boss,” Ryan told THR. The 50-year-old reporter also said that Sanders should be “ashamed of herself” for her performance as press secretary. This interview comes as Ryan has a new book coming out titled Under Fire: Reporting from the Front Lines of the Trump White House.